It’s really fun to think about this – Right now, around the world, there are about two hundred gardeners busy posting photographs of the flowers in their gardens to share with others for the monthly Garden Bloggers’ Bloom Day – the “online gardening event of the month”, the day to show off what you have blooming in your garden! So its mid winter here in Sunny South Africa and in the two gardens, and what do we have to show? Regrettably not a lot – certainly not as much as Diana of Elephant’s Eye who’s lovely garden in Porterville is a profusion of colour right now. Interesting how the different areas and gardening styles all in relatively close proximity differ so greatly. Without further ado, here are our mid-winter offerings. There are hundreds of Camellias and Azaleas blooming in my winter garden and it’s full of pinks in various shades, from bright to pale and everything in between. After a month of rain (in June) and the lovely sunny days we’ve had for the last two weeks there is plenty of growth and everything is turning lush and green. 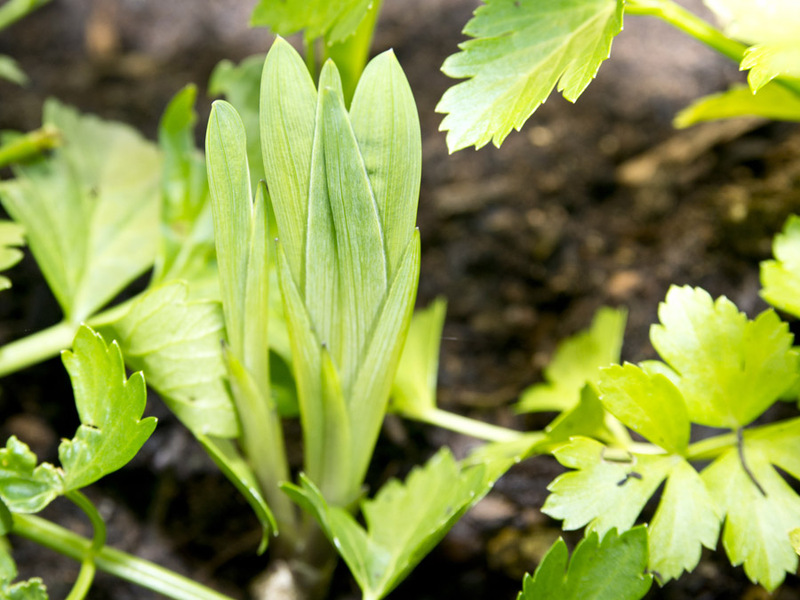 Bulbs are popping up all over and I am excited about Spring … not that long to go now. 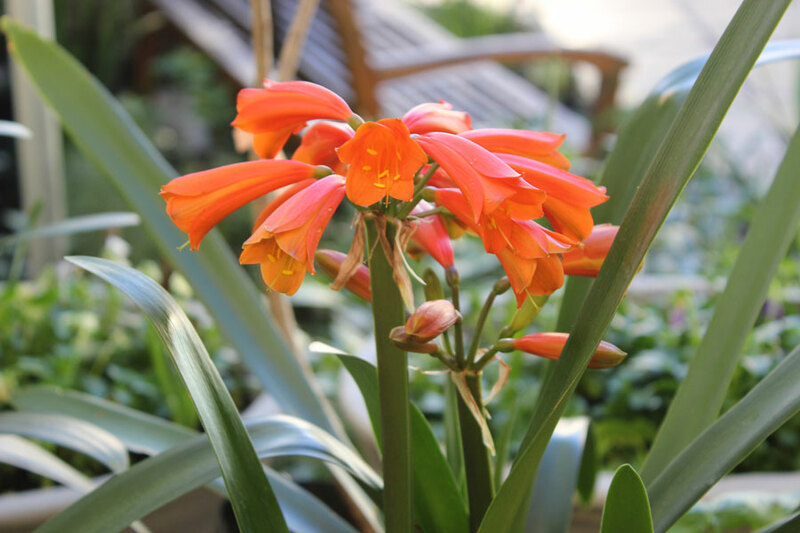 *Clivia × cyrtanthiflora is the name given to hybrids between Clivia miniata and Clivia nobilis with narrow pendent flowers. (Just in case you were interested). This is a green month in my area! 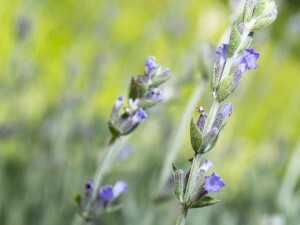 The farm fields that surround the village are lush and the labours of the local farmers are producing ankle-high shoots! Soon, this will be covered in yellow canola! I love the country!! My front garden is also lush and green and the thirsty ground is enjoying the rains and warm sunny days. I have little in the way of blooms, but I did see some interesting new-comers! 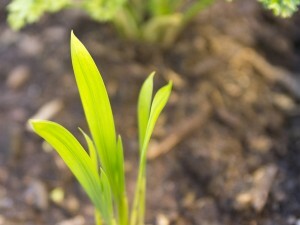 The Bulbinella, given to me in an old pot, was transplanted and is now showing signs of life. My month by month reliables – lavender and violas – are always a pleasure. 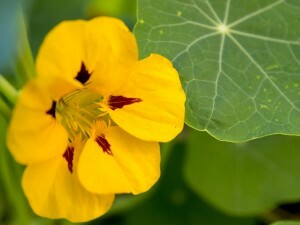 The Nasturtiums have taken over the empty veggie patch, but this is expected and actually I enjoy them. The Fuschias are so pretty now and love the space given to them that the roses usually take over. They always remind me of candy drops. The Blueberry bush is coming to life – it is so neglected in the corner – I really need to give it more love. Christine, my bulbs are growing. I put them in the empty raised bed you gave me so this will be a beautiful show come spring. I have a strange looking onion that is going to flower – I have never seen this so I am curious as to what it is! Like you, I can’t wait for spring – my favourite time of year! But I do love the lushness of July here in the country! Fuschias in full bloom! Pretty, hey? My blueberry bush has buds! Have you ever seen an onion flower? Hi Christine. Thanks for visiting my Bloom Day post and saying hello. Sorry it’s taken me so long to return the visit. So you’re all the way over in sunny South Africa! How wonderful to have roses blooming in winter! My Clivia bloomed in June and July, later than usual, after I moved it outside. It usually blooms in the house in late winter. 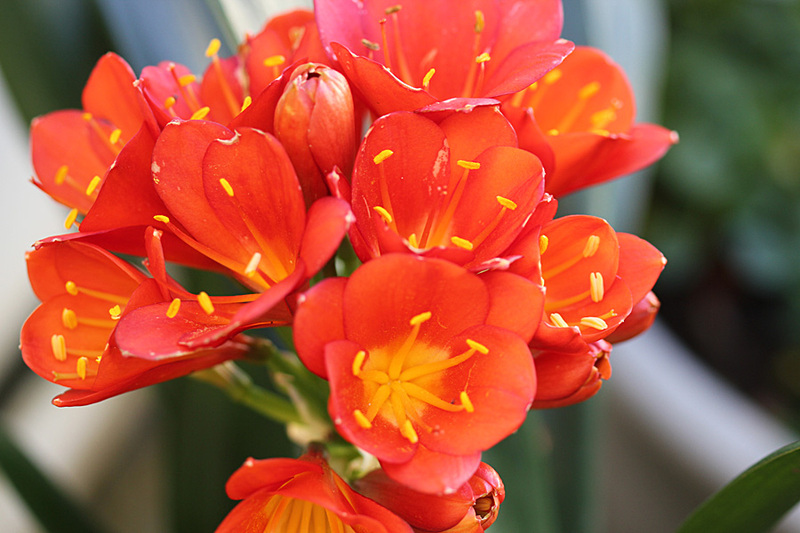 Thanks for explaining the hybrid Clivia. I haven’t seen that one before. Its trumpet shaped blossoms are lovely. Both you and Barbie have beautiful winter blooms. 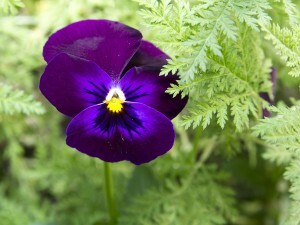 I love the vibrant colour of the violas! Wow Christine- this is winter and you have all those beauts?! ooooh, I love Barbie’s fuschias!! Lovely! 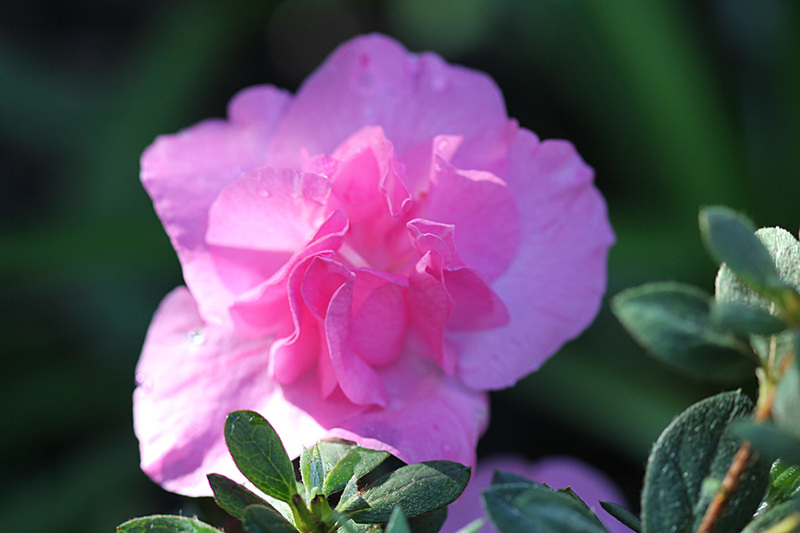 I adore your camellia and Barbie’s fuchsia…gorgeous as always. Even though you are in the mid-winter there is still an amazing number of plants in flower in your gardens Christine and Barbie. Here the only winter color in the garden is white! Happy GBBD! Christine, your Winter garden with so many Camellias is hardly short of flowers, and does the Clivia really flower outdoors in Winter? 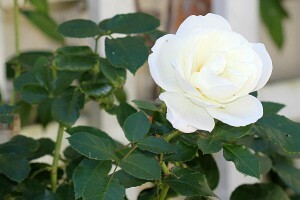 Think I will find a spot for the Iceberg Rose it is such a pure white. Thank you for visiting me recently … and following, as well! Sharing the blog with a friend is such a fun approach to blogging. It’s a great idea and “double the fun” for me (us as the readers), too!! It is amazing when you think of the number of GBBD posts that are created at the same time. Have a great week! 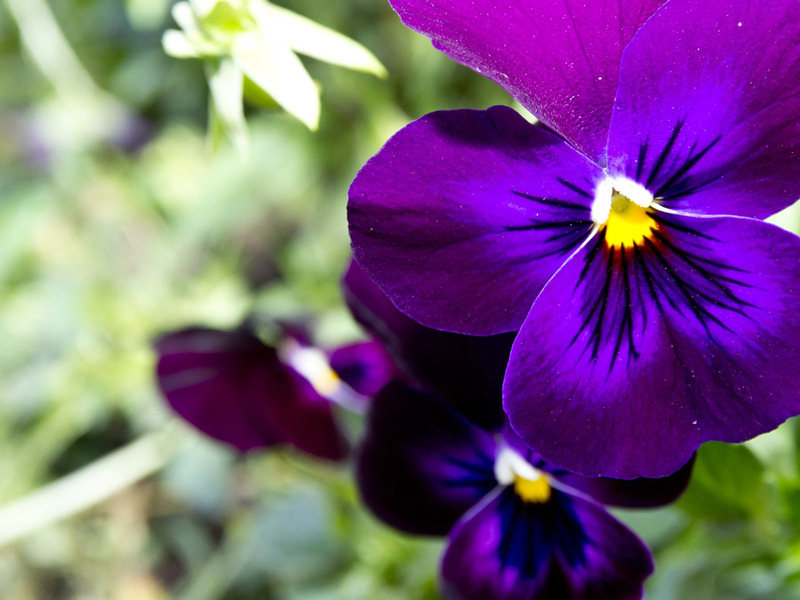 It’s quite an eye opener to see how different both of your gardens are and your lovely blooms. 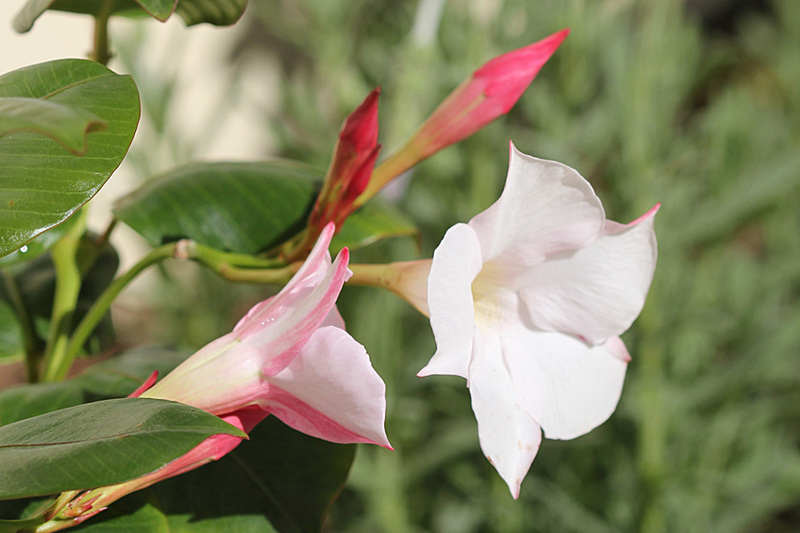 I can relate very much so to Barbie’s garden plants as most of them would be in flower just now in my garden – while in your garden Christine it’s far more tropical with the Clivias. 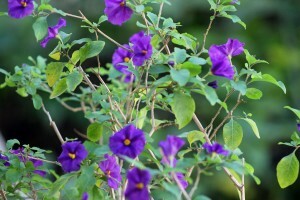 Here they are houseplants but their flowering time is always around Dec/Jan each year. 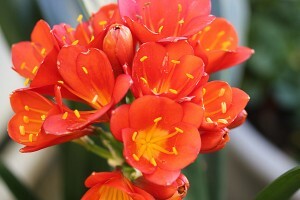 Interesting that you call your Clivia, Japanese Clivia. I always thought it was a South African plant in origin. Happy GBBD to you! I enjoyed seeing your lovely, lovely blossoms. Thanks for sharing. I love all your beautiful blooms and your helper, too! Love GBBD! Madevilla blooms all year long? Now I’m jealous! Love those Nasturtiums…that little red marking at the throat of the blooms is so eye-catching. What a great selection of flowers! Clivias are funny because I think it takes a special person to grow them. Beautiful! Camelias are so delicate! Love them! Wow, your gardens are both producing beauties. But i love most that photo in Christine’s of the photographers guide, haha. Thanks for being a follower of my site. It’s fun to see what’s in flower all over this big beautiful planet of ours. In Dutchland the gardens are a riot of colour as it;s summer. I enjoyed looking at what’s in flower chez you. This is the first combined blog that I’ve come across. Interesting concept…a lot to see and enjoy. I love the variety and the blooms are lovely. 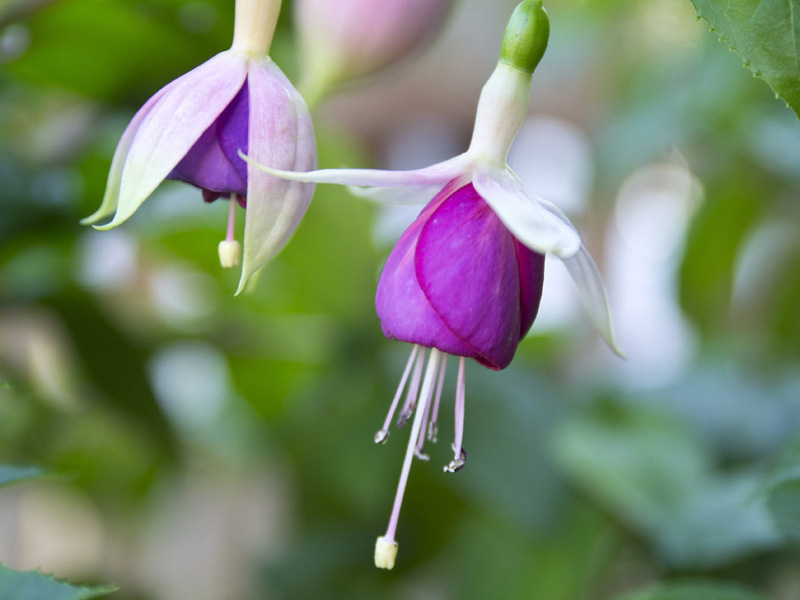 I have been a fuschias lover for some time now…I think I need to get me some! What lovely gardens you both have! Thanks for sharing them. Happy Bloom Day. I can’t imagine Winter filled with such beautiful blooms! Thank you for the tour, and thanks for your nice comment on my site. Happy GBBD! You certainly have lots of blooms for mid-winter! My mid-winter garden is usually white–as in covered in snow:) Love your little helper. lovely camellia christine and pretty fuschias barbara.. you both have beautiful gardens. happy GBBD! What pretty flowers in both gardens. I do like those clivia. I’m only gowing a yellow one…so far! And everyone needs a garden helper! Cute picture! You both have more going on than I would have in deepest winter . Happy GBBD. Giggles! That profusion of colour is – The Camera Always Lies in Collages. And my Clivia are fading away leaf by leaf. Not a flower in sight. Both gardens have gorgeous flowers! I love Christine’s camellias, iceberg rose, azaleas and the bright Japanese clivia and your garden helper is so cute! Barbie’s have beautiful purple blooms especially the cute and sweet fuschias and violas plus the bright nastrutiums! Happy weekend to both of you! Your garden in mid-winter is bee u ti ful. what a nice collection, the clivias and mandevillas are my favorites, i love the dual garden presentations. Love the helper! My little green visitor stayed stuck to my kitchen window for an entire day, was he sunning or watching me as much as I was watching him? @Christine–Cutest photographer’s assistant ever! That’s a very sweet photo. You have a beautiful winter garden. I especially like the bright orange blooms. 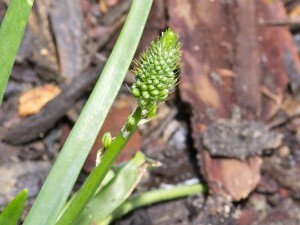 @Barbie–There’s a lot sprouting in your garden! 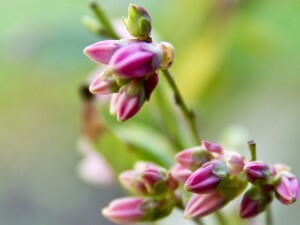 It’s exciting to see blueberry buds. I’ve never seen an onion flower. I hope you post picture of it as it develops. Happy GBBD to you both! I have to agree with Barbara, this time of year in Philadelphia and surrounds is too beautiful. The canola is literally growing and yellowing as we watch it! All the above pics from both gardens are really lovely – it hardly looks like winter at all! I am going to link this post to the Neutrog Facebook page – we are currently taking photo submissions of ‘beauty in the winter garden’ and these certainly qualify! I’m sure our fans will love them. 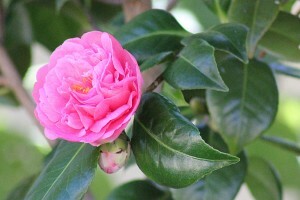 Your Camellias are so beautiful! Love your little garden helper! Happy GBBD. Ah, Camellias – one of my favourites – but I won’t be showing mine off till the sasanqua starts blooming in November to start the winter – early spring season. They still make a good backdrop for the rest of the year. 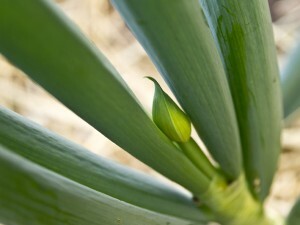 Encouraged by a run of mild winters I tried Clivia outside a few years ago. We promptly had the worst winter in years and they didn’t survive. Your climate is a lot warmer than mine! You both have such beautiful gardens and have many more flowers than we do here at the moment. I love the fuschias. I have a co-worker who grows clivia as a houseplant. She really likes it. I have often thought of trying it…the color is so beautiful. I have seen an onion flower. 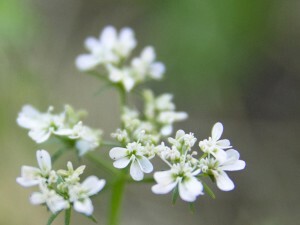 It is usually a bloom such as yours camouflaged in between the stalks that I miss snipping. Happy GBBD! Hi Michelle – Clivia’s like shade and seem to love being in clumps under trees where not much else blooms. 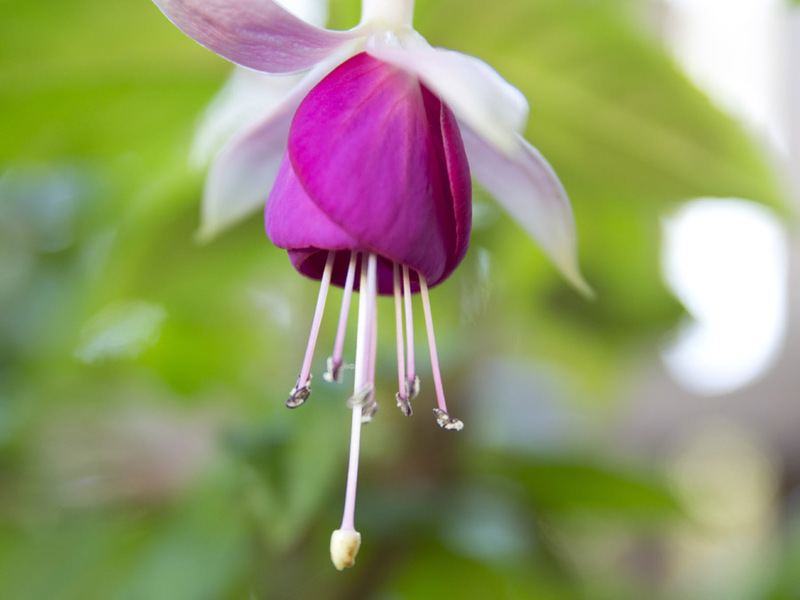 They also do well in pots so if you have snow or frost you could move them inside in winter. Fabulous flowers. Both gardens have terrific colour. Loved the Clivias and those lovely Fuschias. What is kitty doing? … sniffing out the best blooms for photo day? Great little shot. Hi Bernie, I’ll have to do a post one day about it, but my Cat LOVES carrots and celery – he was sniffing the celery and carrots in the veggie patch! He accompanies me on my garden walks, too cute! 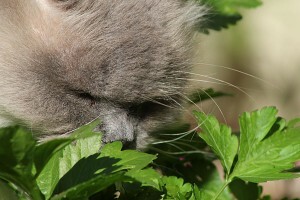 Thanks for the visit, Masha – By the way, I absolutely loved your post on your Garden Friends! Your photos are amazing. Both beautiful gardens have beautiful blooms for GBBD. The kitty is such a great photo subject and those purple violas, stunning. So vibrant.